The primary reason why algae develop in your spa or swimming pool is that you haven’t treated it properly with the best pool algaecide. If you don’t use these products, you will find these organisms floating in uncontrollable numbers on the water. To prevent this, we will help you to choose the best product for your pool. First, you should note the color of the algae in your swimming pool. Different brands are made to treat different types of algae. Match the color of the algae in your pool with the right brand. If your swimming pool has pink or red color algae, it means that it’s infected with bacteria. Find an algaecide that will kill the bacteria and remove them from your pool. You need to make sure that the brand you buy is friendly to your pool or spa. Here, check the product’s label to see if it states that it is pool friendly. You should go for an algaecide that protects your pool for a long time. There are products whose effect last for just a few days. You will waste a lot of money if you buy them. On the flip side, you can get a product that provides a 90-day protection. 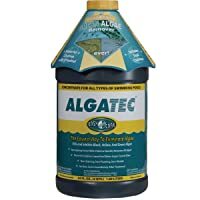 You shouldn’t buy a product that takes weeks to kill the algae. Go for a product that acts quickly and fast. Always look for the stain removing spec when buying your algaecide. There are products that add stains to your pool when you use them. So, avoid them. The other thing that you should consider is whether the product is foaming or non-foaming. Try to use non-foaming brands since you can use your pool immediately. We all like to take a dive into water that is clear. Therefore, you should go for a product that cleans your pool and makes it clear. There are a lot of brands that provide this feature. It is not a guarantee that you will get the best algaecide because it is expensive. Look out for reviews, brand value, and features before you pick one. If you ask professionals about the primary benefit of using algaecides, they would inform you that it is to remove algae. In fact, these products are able to kill algae and keep the surface of your pool free of algae and clean. The best algaecide, whether powdered or liquid, can chemically remove the algae quickly. You will never come across another product that can kill these organisms faster than an algaecide. This is why pool owners spend a lot of money to get them. Here is a review of the top pool algaecide on the market today. 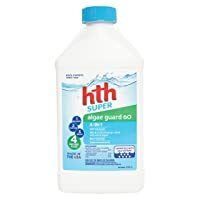 HTH Algae Guard 60 is a non-foaming and concentrated algaecide that is very effective. When used frequently, the product kills and prevents the development of algae. In fact, it controls black, yellow, and green algae from spreading in your pool. It is also compatible with your pool salt system and you can swim immediately after applying it. The product has 60 percent strength and should be used regularly. In The Swim Super is a fast-acting product that controls and kills different types of algae. It contains 23.5 percent copper triethanolamine complex as its primary ingredient. Just like the HTH Super Algae, this product is non-foaming, meaning you can take a dive into your pool immediately after use. You don’t require a lot of this product to keep your pool free of algae. The recommended dose is 2 oz per 10K gallons of water. This product is safe for use in all types of swimming pool as well as different types of filters. It helps to clarify your pool water, preventing the development of unsightly plants. Another great feature Kem_tek KTK-50-0060 is its ability to last long. Hence, you don’t need to spend more money to treat your pool. It is also a non-foaming product that ensures you can enjoy your pool immediately after using it. 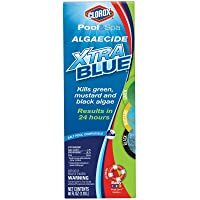 If you are searching for a great product to keep your pool clear, then the Clorox Pool and Sa Algaecide is the product for you. 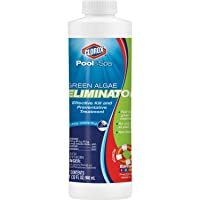 This is an all-in-one algae killer that kills green, black, and mustard pool algae. Very economical, the product treats a pool of up to 25K gallons and it also prevents algae development. The product is also very affordable. PoolRX Algaecide Unit offers you the simplicity of killing algae. You simply need to place it in your skimmer basket or pump basket and it will do the rest. The product removes all types of algae and doesn’t add chemicals to your pool. Actually, it removes chemicals from your pool. Also, it remains effective for about 6 months and you can use for spa and pool care. 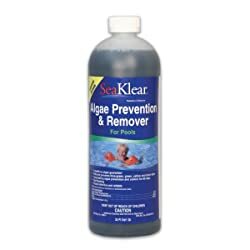 SeaKlear guarantees you a 90-day period with no algae in your swimming pool. It is very effective and reliable and kills and prevents green, back, yellow, and blue-green algae. The product is also non-staining and non-foaming when used according to the provided instructions. You can use 16 fluid ounces to treat 10K gallons of water or 32 fluid ounces to treat 10K gallons if algae are severe. 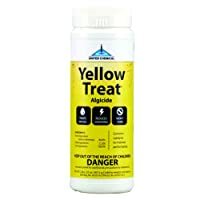 United Chemical Yellow Treat is one of the best and most trusted products for killing yellow algae. It is a non-toxic product that you can use in your spa or swimming pool. With a recommended dose of 5 oz per 10K gallons of water, you are assured of getting value for your money. 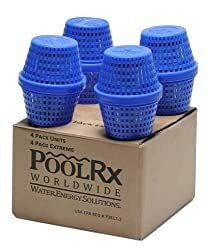 The product doesn’t strain your pool and you can swim immediately after using it. This product will not change the sanitizer levels or your pool water pH and you can enjoy your pool after using it. Instead of starving algae, it kills them and prevents them from growing again. It kills most algae within 24 hours and the black algae within 10 days. The best thing, it is salt pool friendly and doesn’t contain bromides or metals. It also works well with your pool chlorine. 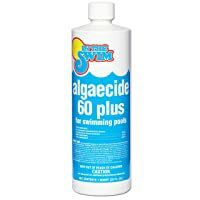 The In The Swim 60 Plus is a non-foaming and non-metallic product that kills most algae in your swimming pool. It is not affected by your pool’s PH and is ideal for use in well water. Moreover, you can use it alongside your shock treatment. Also, it doesn’t stain your swimming pool. It kills yellow, green, and other types of algae. With Clorox Green Algae Eliminator, you will always be one step ahead of algae. It is a non-foaming product that you can use to treat your pool and still take a dive when you want. The product effectively kills and prevents the growth of green algae and is suitable for all swimming pools and spas. To know precisely the types of algae in your pool, look carefully at the spot where it has started to grow. Green Algae – They float in your pool’s water, making it look cloudy and providing it a greenish color. These algae can also attach to the floor and walls of your pool. Yellow algae – These algae appears like sand or pollen in a shady corner. Yellow algae are also known as a mustard or brown algae. It is rare and chlorine-resistant, making it hard to treat. Black algae – Black algae make their own food, so they grow and grow. Additionally, their roots attach deep into the surface – making them hard to kill. They require an aggressive treatment. Q1: My algaecide is written 60%. What does this mean? A: That means that your algaecide has 60% strength or concentration. Different concentrations work for different pools, depending on the algae present. Q2 : How long will it take for an algaecide to kill algae? A: It will depend on the brand you purchase. Some will take hours while others will take days to clear all the algae from your pool. 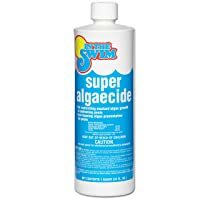 Still asking “what is the best pool algaecide” for my swimming pool? If you cannot make your mind which one among the 10 products in our list is the best pool algaecide for your pool, then try the HTH Pool Algaecide Super Algae Guard 60 (67064). Of important, ensure that the product you buy kills and prevents algae from growing.